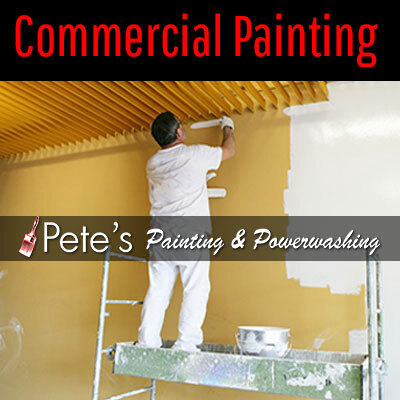 Pete’s Professional Painting & Power Washing understands the need for proper scheduling and attention to details when handling education center painting projects such as refurbishments. With busy hallways, classrooms, restrooms and dorms, a university or school painting projects can pose various challenges such as teaching being temporarily unavailable. However, no educational center can afford being temporarily out of service. Our professional painters understand the need to conduct large-scale painting over the weekends, during after-hours, over the holidays or during summer. We are flexible and can easily work with your schedule. Your students, staff and administrators won’t just be impressed with the work Pete’s Professional Painting & Power Washing will do, but also enjoy and be satisfied with how we get it done. Whether you want the exterior or interior of your school revamped, our local painting experts can get the job done! Complete exterior surface painting on stucco, wood, vinyl, etc. White is a safe color with a modern, sleek appeal and for this reason, it has been used on ceilings for many decades. Although you can paint your ceiling any color you prefer, you need to know what each color represent, including pros and cons before opting for one. For instance, if you have low ceilings, paint them in light hues and your walls in dark tones to create the illusion of higher ceilings. The converse is also true; a perfect way to create illusion of lower ceiling when it’s actually high.